North of Jamaica Bay Wildlife Refuge in Queens is a middle class neighborhood, predominantly Italian-American, known as Howard Beach. Named for William J. Howard, a Brooklynite who owned a goat farm in the area in the 1890s, the neighborhood was essentially founded by Howard’s creation of the Howard Estates Development Company, which dredged and filled enough land on which to build a neighborhood. Perhaps most known throughout New York City for mafia ties and a couple of hate crimes against African-Americans, Howard Beach was devastated by Hurricane Sandy. But it wasn’t the history of Howard Beach that led Donna and I to Howard Beach a week ago: no, it was the parrots. 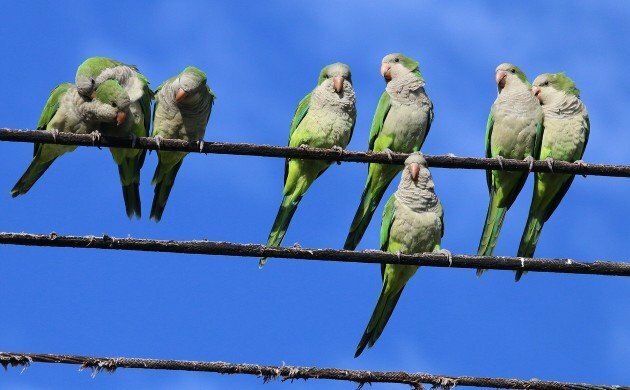 You see, like many other neighborhoods in and around New York City, Howard Beach has a significant population of Monk Parakeets, a South American parrot species that has adapted well to life in New York City, Chicago, New Jersey, Connecticut, Florida, and Texas after having escaping or being released from captivity. 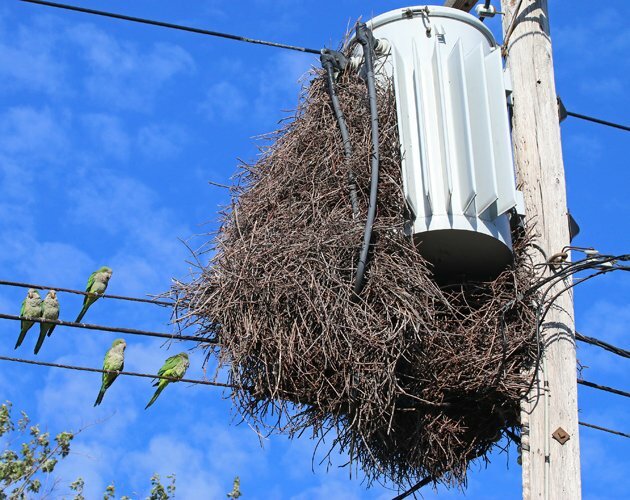 Old Howard Beach in particular has quite a few of the large stick nests that the Monk Parakeets build, and their raucous cries can be regularly heard as the green, gray, and blue parrots wheel overhead. For most residents of the five boroughs, parrots are an anomalous sight in New York City. 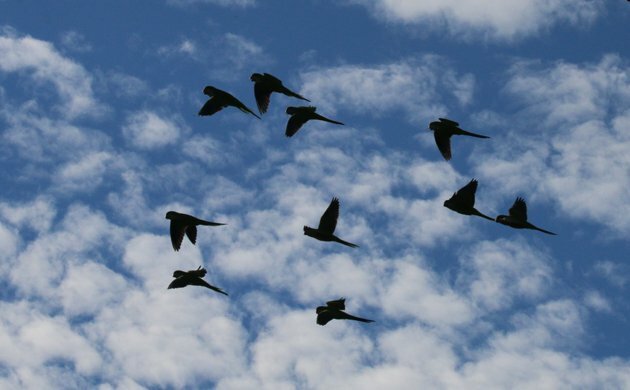 Used to pigeons, sparrows, and starlings, that urban trifecta of introduced birds, it takes a few moments for the idea of a flock of parrots over city streets to really sink in. But once it does the idea is pretty popular. Who wouldn’t prefer parrots to pigeon poop? Well, maybe those who have an active nest in front of their house, who have to deal with lots of dropped sticks and lost sleep. 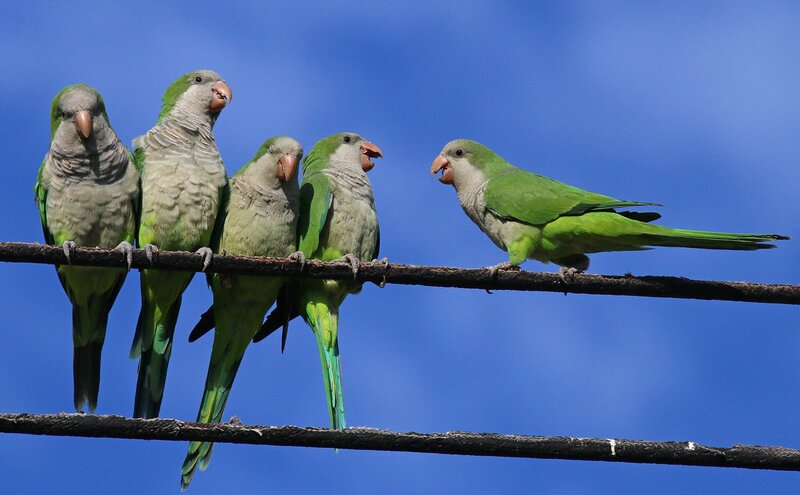 But we found those in Howard Beach who share their neighborhood with the Monk Parakeets to be not only accepting but proud. Passersby would pause to comment on “their” parrots and we heard not a single complaint about noise or messes. Donna and I weren’t just there to see the parrot-show though. We were also there with a reporter and photographer from The New York Times who were writing an article about Monk Parakeets. And while they were doing their best to keep to the serious and objective business of getting the story, it was pretty easy to tell that they were taken with the marvelous monks squabbling on the power lines over our heads. How could they not be? We talked about Monk Parakeets for a couple of hours while watching and photographing them overhead. It was a wonderful outing for a half-morning and the only thing that made it less enjoyable was that I had to cut it short to go to work. If you get a chance to visit a neighborhood with Monk Parakeets take advantage of it and enjoy! I know I do! I once had one visit my backyard feeder in suburban Maryland just outside of Washington, DC. Such beautiful pictures. Beautiful parakeets!! 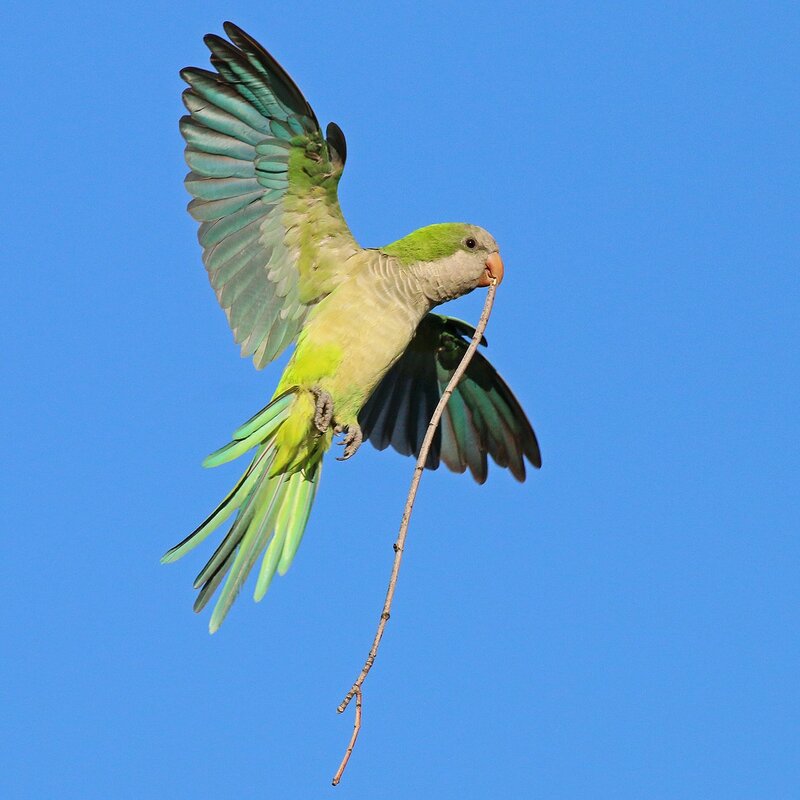 I became interested in Monk Parakeets after seeing so many in Spain last month. Apparently some escaped from pet shops, and people released others when they realized they were too noisy to be pets. I first noticed a huge flock in El Retiro park in Madrid, and enormous nests in the park behind the national palace. When I got to Barcelona, they were out of control! There were hundreds,they were in every park and every neighborhood and they are extremely noisy. People are concerned as they’re so destructive to the environment in the parks when they tear apart trees to build their nests, usually in Date Palm trees, and they scare away other birds. I photographed one flock with several wearing little tags around their necks, maybe tags from pet stores. How About a No-Hunting Stamp?